Currently, 90% of US children and adults consume less than 1 cup of yogurt per week. This only represents approximately 0.1% of a serving of yogurt per day, which is less than a quarter of the recommended serving from the milk group. 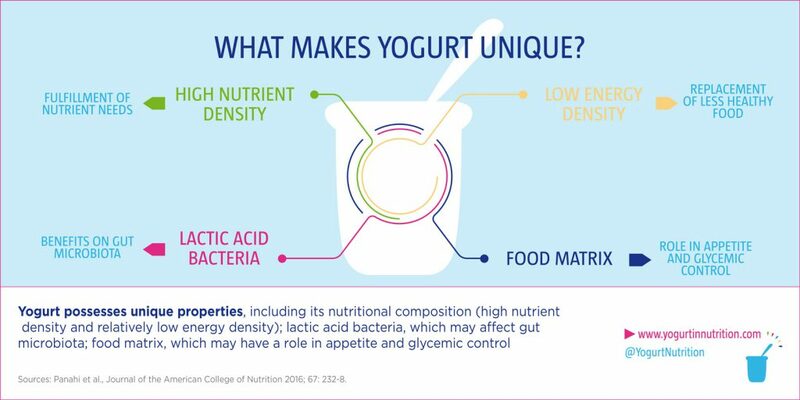 However, low-fat and non-fat yogurts can play a role in achieving a more nutrient-dense diet and improving the nutritional status (2,3). Yogurt naturally contains calcium and potassium, and some products are fortified with vitamin D.
Cardiovascular diseases, cancer and type 2 diabetes (T2D) are among the main causes of the loss of disease-free years in numerous countries. The rise in obesity also increases the risk of these chronic diseases. How foods like milk and dairy products can influence a particularly alarming context? A publication(1) based mainly on meta-analyses of observational studies and randomized controlled trials indicate some promising results. In children as in adults, milk and dairy products are associated with a lower risk of obesity, with an improvement of body composition and a better weight loss during a diet including dairy products for the adults. The study also shows that the risk of T2D and cardiovascular diseases, particularly stroke, is reduced with regular milk and dairy products consumption. Despite there was no significant association with the risk of bone fractures, results highlighted beneficial effects of milk and dairy intake on bone mineral density. This food category is also associated with a reduced risk of some cancer subtypes (colorectal, bladder, gastric and breast cancer) and has no detrimental effects on prostate cancer incidence. If more studies remain needed, the authors concluded that milk and dairy products show more beneficial than detrimental effects on health. Traditionally, the nutritional evaluation of the relation between diet and health has focused on individual food constituents or nutrients separately. This approach, linking one nutrient to one health effect, may partly explain some of the discrepancies between a food’s predicted health effects and its actual health effects, as a diet does not consist of single nutrients. Foods have complex structures, which affect digestion and absorption and may generate interactions within the food matrix, thereby altering the bioactive properties of nutrients in ways that are not predictable. This appears more and more evident for the dairy matrix(4). The dairy matrix has higher beneficial effects on health than single nutrients and there are differences between the metabolic effects of whole dairy, and those of single dairy constituents, on body weight, cardiometabolic disease risk and bone health. Greek yogurt is traditionally obtained by straining normal yogurt, which gives it a thicker texture. It is a concentrated fermented milk with a protein content of at least 5.6 g per 100 g. During the draining process, the aqueous part of the milk – the whey or lactoserum – is removed, which explains the low lactose content of Greek yogurt. Both type of yogurt have the beneficial interests of nutrient-density and fermentation. Webb D, Donovan SM, Meydani SN. Nutr Rev. 2014 Mar;72(3):180-9. doi: 10.1111/nure.12098. Ragovin H. Tufts Nutrition, 2015, vol. 1; n°6: 14-17. Kongerslev Thorning T. et al. Whole dairy matrix or single nutrients in assessment of health effects: current evidence and knowledge gaps. American Journal of Clinical Nutrition, 2017. Yogurt, an ally in the fight against diabetes?